White House press secretary Sean Spicer wrongly claimed Wednesday that a Fox News reporter had his phones tapped while Barack Obama was president. 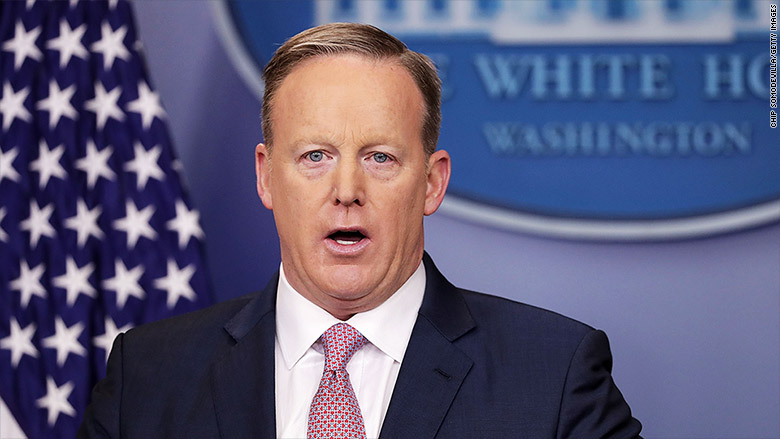 "James Rosen had his phone, multiple phones tapped," Spicer said at the daily press briefing. The comment was made while Spicer was addressing a question about leaks from the intelligence community and new WikiLeaks' documents detailing alleged CIA hacking operations. That claim, which has been propagating in conservative media for several days, was shot down by none other than Rosen himself during a recent appearance on Fox News. "I was not wiretapped, my parents were not wiretapped, which is where you place a listening device on someone's telephone line and you listen to their conversations," Rosen told Fox & Friends on Sunday after the show's hosts claimed his phones were tapped. Instead, Rosen explained, former Attorney General Eric Holder had secretly designated Rosen a criminal co-conspirator -- because he had received classified information from a former State Department contractor -- thereby giving the government permission to subpoena Rosen's emails and phone records, including those of his parents. When asked to clarify the administration's stance, White House deputy press secretary Sarah Sanders told CNNMoney, "There are multiple reports on this matter." Sanders did not cite specific reports, but several right-wing outlets have falsely claimed that the Obama administration wiretapped Rosen. "In fact, it's widely known that Obama's Justice Department targeted journalists with wiretaps in 2013, most famous Fox News' James Rosen and his family," The Blaze reported, erroneously, on Saturday. Spicer's erroneous claim comes just days after President Trump alleged -- with no evidence -- that President Obama had wiretapped his Manhattan headquarters in 2016. CNNMoney reached out to Rosen for comment on the matter, then received an email from Fox News press relations declining to make Rosen available for an interview. On Twitter, however, Rosen confirmed that his phones had not been tapped, but that his phone records and emails had been obtained by the Justice department.